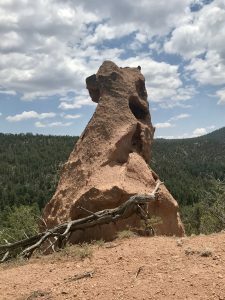 Now that the National Forest’s are back open it is time again to hike another of the many trails within an hour from Albuquerque. 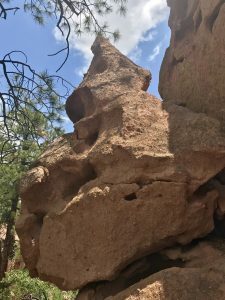 This is a 4- mile out and back trail with towering Ponderosa pines and sculptured red sandstone goblins. Hike is generally rated as easy, but exploring in and around the goblins can be strenuous. We will meet at the Merc parking lot on NM 165 here in Placitas at 8:55 on Sunday August 12 for a 9 o’clock departure. Wear good hiking shoes/boots, bring a hat, sunscreen and possibly a hiking stick. We will provide the water. Send me an email at haigh44@yahoo.com so I alert you if the Forest closes again. Only the mountain has lived long enough to listen objectively to the howl of the wolf.